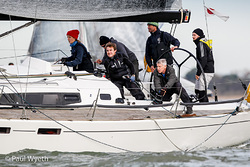 Hamble Winter Series : Performance 40's at Autumn IRC Champs.? Performance 40's at Autumn IRC Champs.? 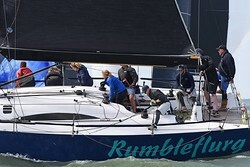 Having just secured a three year partnership with Hamble Yacht Services, the focus at the 2018 HYS Hamble Winter Series now turns to the first weekend the 6th & 7th October, and what an exciting weekend this is.The Autumn IRC Championship kicks things off with 5 races over two days. If this wasn't enough the Performance 40 Class are using this event as the final round of their championship. 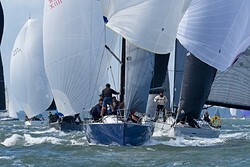 In what is their inaugural season the Performance 40's have attracted 27 teams to their series and the Autumn IRC Championships will be a double point scoring finale. There are 3 boats in serious contention for the overall prize. Cobra, Mike Blair, is leading the series and being closely watched by HRSC Commodore, Steph Merry, who used to sail with them. Showing true Yorkshire grit, Rob Bottomley's Sailplane, is hanging on in second place and Nifty, Roger Bowden, a Winter Series regular is in 3rd spot. The gap is only 4.5 points between 1st and 3rd, so "game on" as they say. The other emerging form teams, Rumbleflurg, Juno, Zero, Xinska and Jitterbug will be hoping to spoil the party. David Swete who masterminded the P40 Series comments: "It has been fantastic to see just how close and exciting the P40 racing has been in 2018. The momentum that the class is gaining is a clear indicator that we have the formula right. The season is coming to a dramatic end at the HYS Hamble Winter Series and, I am looking forward to seeing how it all unfolds." The P 40's and any other Class 1 boat have the chance to continue racing in both the main series (8 Sundays), or the Hamble Big Boat Championships (3 Sundays) for the prestigious Big Boat Champions trophy. The other classes in the IRC Championships look interesting too. Two HP 30's, Pegasus DekMarx, Farr 30 evo and Pandemonium, Farr 280, will be hoping for some blowy downwind legs. J109's Jago, Mojo Risin and Jumping Jellyfish will keep everyone on their toes and Elaine JPK 1010 will be hard to beat as usual. The smaller boats also look competitive with Olly Love and Sam Flints former National Champion Impala "Two Frank" taking on the evergreen Flashheart and the Corby 25, M'Enfin? !, Bertrand Malas and Sophie Chudziak. 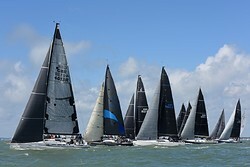 This year there is a BOGOF operating for those who enter the whole of the HYS Hamble Winter Series. Enter all 8 weeks and get the Autumn IRC Championships FREE. The teams just have to remember to turn out on Saturday the 6th October to make use of this great offer and do the first three races! As always, there will be a HYS Hamble Winter Series Sunday Sponsor and a prize giving back at HRSC. The sponsor for this first weekend is local hostelry, The Bugle, a winter series regular with a 99 year connection to the club. Prizes for the Autumn IRC Championship and the Performance 40's will also take place in what promises to be decent party to get the series started.